The days are getting longer, temperatures are creeping up, and you may have even swatted a few mosquitoes. Summer is definitely on the way, and facility managers know that means increased energy costs and a struggle to keep the building cool. Fortunately, you don’t have to cross your fingers and hope for cooler weather. 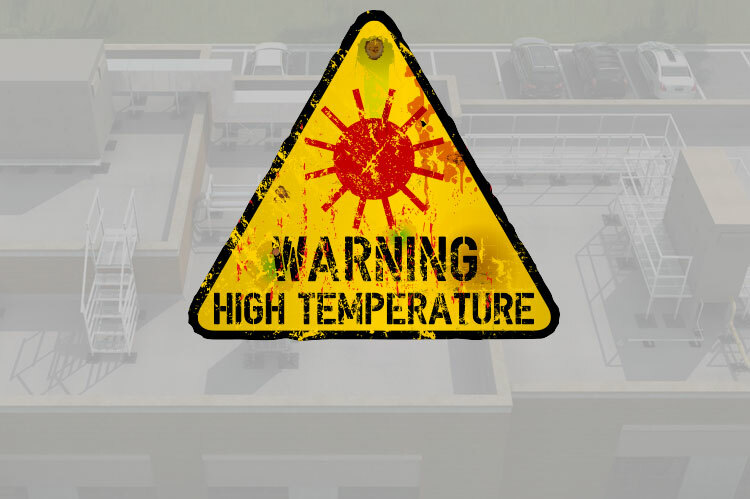 With some proactive roof management, there are several things you can do to help keep your building cool. Roof management is a year-round endeavor – but, let’s face it, nobody wants to go up on the roof during the summer heat. However, not doing that routine maintenance can significantly reduce your ability to keep the building cool. Any break in the building envelope – whether it’s a torn roof membrane or some missing flashing – can be a conduit for heat. In addition, unmaintained roofs develop leaks. And leaks lead to wet insulation, which then becomes largely ineffective. So grab some sunscreen, a hat, and some water, and go inspect your roof before it gets any hotter. Reflective coatings are a cost-efficient way to increase a building’s energy efficiency. In warm climates, they’ve been shown to reduce heat gain through the roof by an average of 50%. That, in turn, reduces electrical costs during times of peak demand by 10-15%. While coatings are inexpensive and relatively easy to apply, not all coatings work with all roofing materials, so it’s important to choose carefully. Also, to see the most benefit, select a coating that has an Energy Star rating. Sustainability is a priority for both businesses and consumers, so installing a green roof is a great way to demonstrate corporate social responsibility and maybe even generate some sales. But there are also more immediate benefits. A green roof can reduce cooling costs by as much as 50%. One reason is that it provides a physical barrier between the roof and the sun’s rays. In addition, water evaporation from the growing medium and from the plants themselves helps cool the roof even further. Just make sure that your building’s structure can bear the extra weight! Thanks to advances in energy efficiency, today’s facility managers have a number of choices when it comes to types of insulation, ranging from polystyrene foam to higher-tech options. However, not all types of insulation are compatible with all roofing systems. Sometimes it’s a matter of materials; other times, it’s more about space, as some types of insulation require more space than others. The best type of insulation for your building is the one that works with your particular roof and meets the requirements of both local codes and your insurance carrier. If you’re building a new roof – or if your insulation is old – consider updating it with some modern options. You may not be able to stop the summer heat, but, through careful roof management, you can reduce its impact on your building. What methods have you tried to keep your building cool?